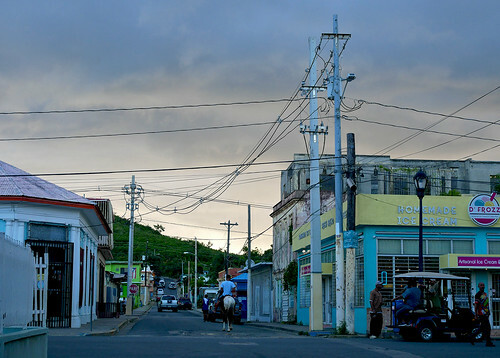 I’m staying in Esperanza, the smaller of two towns on the island, located along its Caribbean-fronted south shore. Playa Esperanza is the local beach here, and at one end of it lies Muelle de la caña, or sugarcane pier; a ramshackle structure that extends outwards towards a pair of cayos or keys. Till the 70s, sugarcane formed the backbone of the Vieques economy, and apart from some plantation ruins, not far west from here, the pier is about all that remains from that era. Nothing more than a glorified diving point for locals today, its one of only two landmarks Esperanza is notable for. The town’s other claim to fame is El Malecón, Spanish for boardwalk or promenade. Lined by a handful of bars and eateries on one side, and on the other, by a concrete promenade – still broken in parts following Hurricane damage – El Malecón is, for all practical purposes, Esperanza‘s main drag. 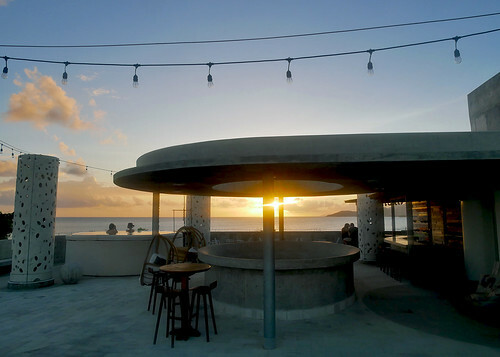 The focal point of all gatherings, come sundown, it boasts Instagram-ready Caribbean views every other time… Its brutalist facade looks strangely out of place at first, but El Blok, a 22-room boutique hotel, fits right in to the Vieques aesthetic, and most certainly, the island’s vibe. As I emerge on to its stylish rooftop, Mojito in hand, the infinity pool is occupied by two girls getting their share of selfies, and on the far corner, a couple awaiting sundown. As it was below, its uncrowded and unhurried up here as well. The remote island feel becoming all the more apparent to me. Following Hurricane Maria‘s devastation, electric supply is still scarce in Vieques, so when night falls, a single strip of ferry lights is all that illuminates El Malecón. Its an incredibly pretty sight though, accentuated even more by the glow of a full moon. The ambient soundtrack changes too, with the high pitched croak of the Cocquí, a tiny species of frog native to Puerto Rico, dominating the evenings proceedings. I wander past the Malecón and turn on to a side street, where light emanates from a distant building, accompanied by somewhat raucous voices and faint music. Esperanza‘s only market or mercado is a block or so removed from the shore, but being one of the few establishments with its own power back up, becomes a hub of activity for locals every evening. On the patio outside, a señor strums a guitar, and a group of middle-aged men sip cervezas and play cards, chided occasionally by an abuela, as the store owner chats at length with a regular. There’s only about four main roads on the 20-mile long island, and even fewer means of getting around. Publicos, or shared vans, are on call and will arrive at fairly short notice, but the costs quickly add up, of course. 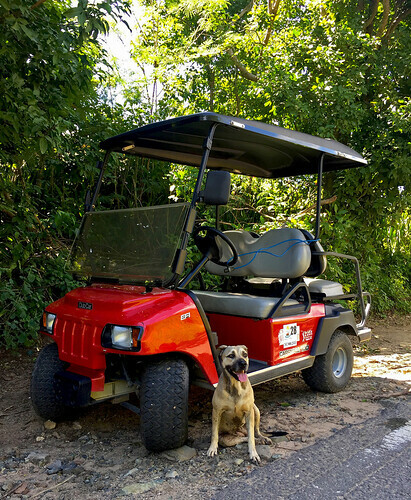 If you plan ahead, there’s one rental agency on the island that will rent you a vehicle, and even offer to fetch you from the airstrip or your hotel. And then there’s the last minute set, like myself, who just have to make do with whats available. Thanks to a largish sign, the hidden entrance to the trail is now a lot easier to find than what the guidebooks make it out to be, but the trudge remains just that – a slow, twisty, somewhat undulating half-mile trek, often wading through shallow water. Its all worth it at the end though, as you emerge on to the hidden gem that is Playa Negra, a beach that gets its color and name from volcanic sand, and which is gleefully devoid of humans. Post hurricane, Playa Negra has receded a fair bit, so if you’re looking for a wider strip of sand, you will have to walk further west along its shore. On the Atlantic-facing north end of the island though, the story’s quite different. 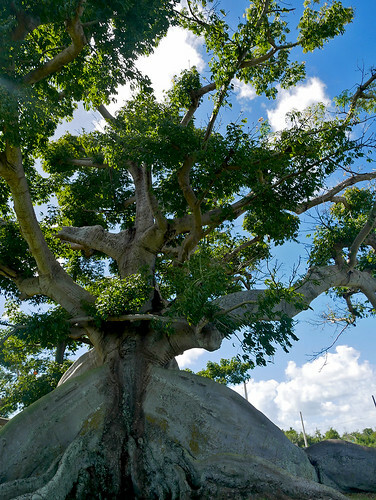 Three centuries old, and the survivor of many a hurricane, is Vieques‘s beloved Ceiba tree – an island institution in its own right. 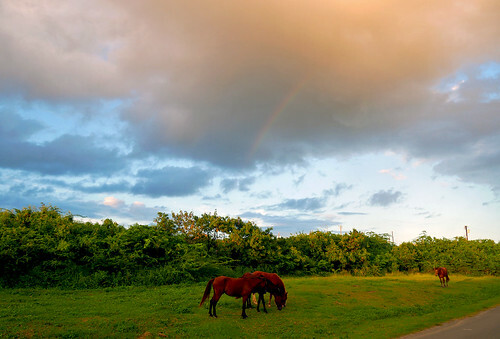 Adjacent to it, wild paso fino horses graze the grounds of the Ceiba ecological coastal park, where an endearing wooden sign points to the tree on one side, and mas playa or more beach, on the other. If you heed that advise, you’ll find yourself at Playa la Peña, another fabulous, and completely deserted beach. 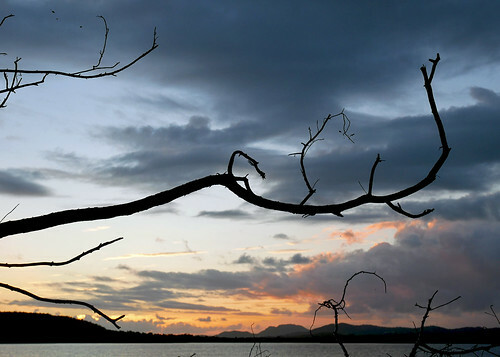 The Ceiba lies in a part of the island known as Mosquito, which has a namesake pier to its credit. 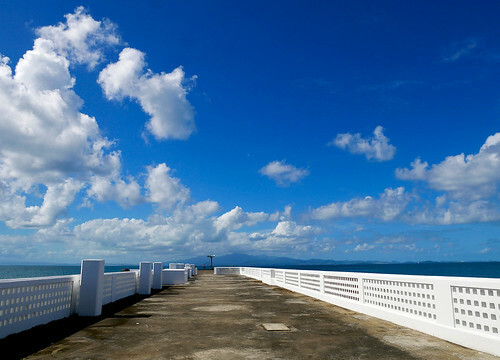 Located at the end of a mile-long causeway, the pier, referred to locally as Rompeolas, was intended to connect Vieques with the Puerto Rican mainland, but thankfully, that link never materialized. 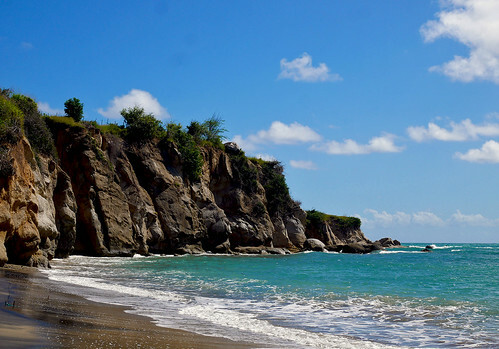 For over six decades, only the middle quarter of the island was open for use by Viequenses, as the locals are referred to. The eastern and western three quarters of Vieques were U.S. Navy property, which they used, mainly, for bombing practice. It wasn’t until the Clinton-era, when a civilian was killed by an errant bomb, that the practice finally came to an end. 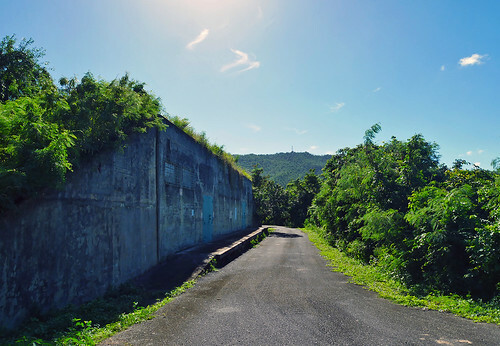 While large swaths of the island continue to be out of bounds, a lot of that land has since been earmarked as a wildlife refuge, and in the western part of Vieques, there are still some areas where relics from that dastardly era can be found. As I quickly discover, driving though a deserted part of an already sparsely inhabited island, with absolutely no cellular service, does have its challenges. And that’s where old world skills like map reading and orientation come in handy. The less said the better about the maps though. So when I finally unearth the first of those well-camouflaged ammunition bunkers, its a moment of triumph for me… The island, like much of Puerto Rico, enjoys great weather and plenty of sunshine most of the year, such that even in the winter months, day time temperatures hover around the 80F or 27C mark. But when you’re out and about for the entire day, the sun can get a little harsh, and ever so often one needs to cool off. 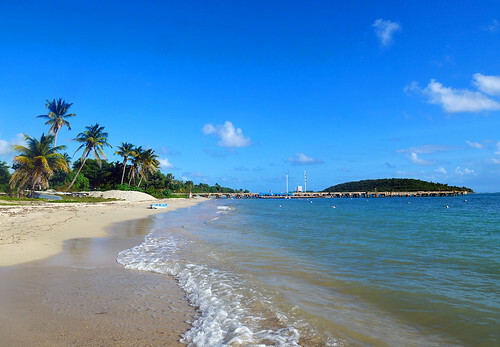 Luckily, there’s twenty beaches to choose from around the island, and I pull up at Playa el Gallito, the often overlooked, and completely unsung strip of sand on Vieques‘s Atlantic coast. Housed in a shocking pink colonial building, Roy’s Coffee House is hard to miss. For all practical purposes, it marks the entrance to Isabel Segunda, the island’s second and larger town, and de facto capital. Roy’s is closed though, earlier than advertised, and the owner rattles off no hay electricidad from a distance, shrugging his shoulders. But I’m determined to get some caffeine so I continue further into town. Thankfully, its business as usual at D’Frozz, an ice cream parlor that offers a lot more than its facade would suggest. 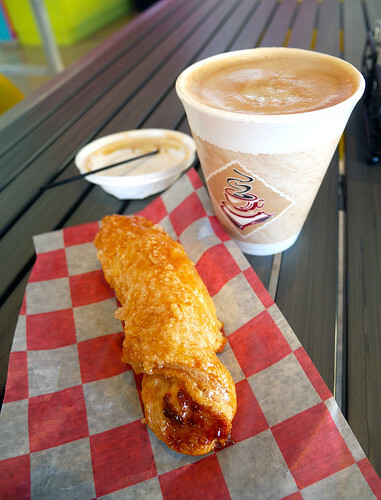 I end up with a solid cafe con leche, and the most delectable of cheese pastries, el Quesito. Outside, a group of gents have congregated around a golf cart, catching up on the days gossip, as a horseback rider trots through nonchalantly. D’Frozz takes up one corner of the colorful intersection of Calle Carlos Lebron and Calle Muñoz Rivera, and for the island town of Isabel Segunda, this is as downtown as it gets. Isabel Segunda is where you’d end up at were you to take the ferry over from the Puerto Rican mainland. 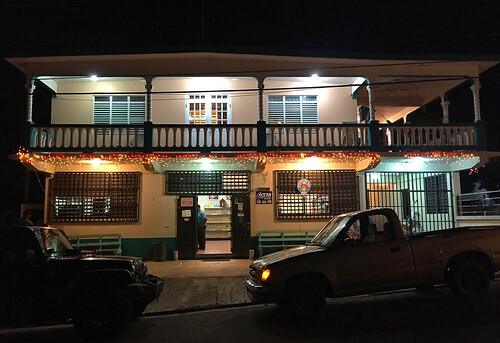 Until recently, the ferries would set off from Fajardo, but all operations have been moved over to Ceiba, the same town one flies in from currently. The one thing that remains a constant though is the mystique surrounding ticket availability, and the very reliability of the ferry service. Curious to see what the fuss is all about, I make my way down to the ferry terminal, distracted only briefly by whats turning out to be a spectacular evening… Known for their natural four-beat gait, the paso fino horses, that can be found roaming free all over the island, were first brought in by Spanish settlers to patrol their sugar plantations. Paso fino, in fact, means smooth step. You can see them in abundance at the Vieques National Wildlife Refuge, which makes up much of the islands eastern half. Driving along its main access road, I can’t help but stop, every few hundred meters, and just stare in admiration. The handsome colts and stallions making quite the sight under a dramatic evening sky. 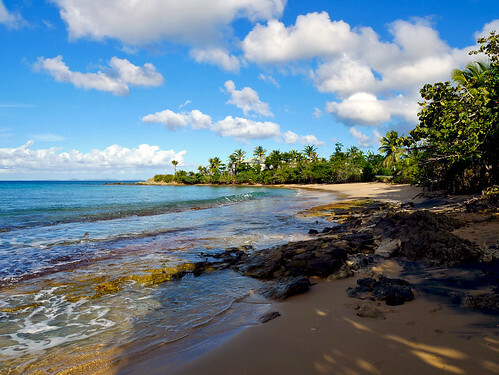 Considered one of the most ecologically diverse in the Caribbean, the Vieques National Wildlife Refuge was created from former navy managed lands, in the early 2000’s. Today, one could easily spend the better part of a week exploring the many beaches, coastal lagoons, mangrove wetlands, and forested areas within. On my tiny little sojourn this evening though, Bahía Puerto Ferro would have to suffice, to catch the last fragments of daylight. 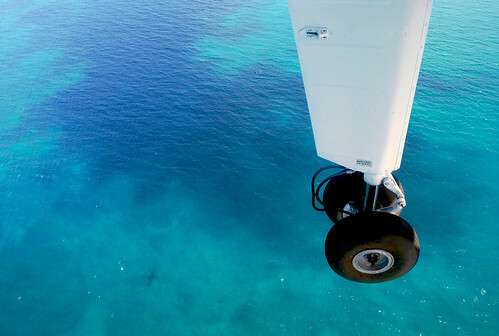 As the eight-seater Islander takes to the skies, I look down at the turquoise-colored splendor below, fondly reminiscing the last 48-hours spent on the island. 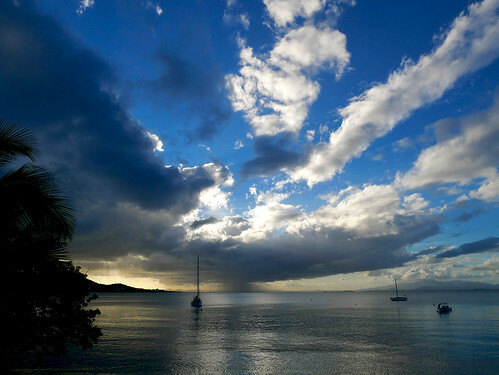 And then it strikes me – I completely missed out on the one thing that Vieques is actually known for – the world’s brightest bioluminescent bay! 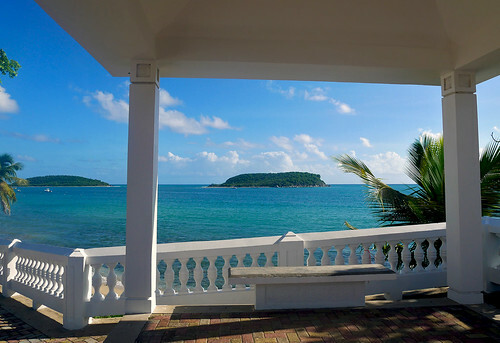 Addendum: If this post hasn’t convinced you sufficiently, the New York Times just placed Puerto Rico at the very top of its 52 places to Go in 2019 list. ¡Vamos! A full set of photos from my visit to Vieques and El Yunque National Park (on the PR mainland) can be viewed on my Flickr. Picture postcards these are. Makes me want to pack my bags n go right away! I had a chance to go to this overall Isla Bonita more than a decade ago, almost went to Viequez but only had time to do a leisurely road trip around the entire ‘main’ island 🙂 including a hike in El Yunque, swimming in the bioluminescent waters around PR and much more. Your pics as always, vivid and tell a story all by themselves!